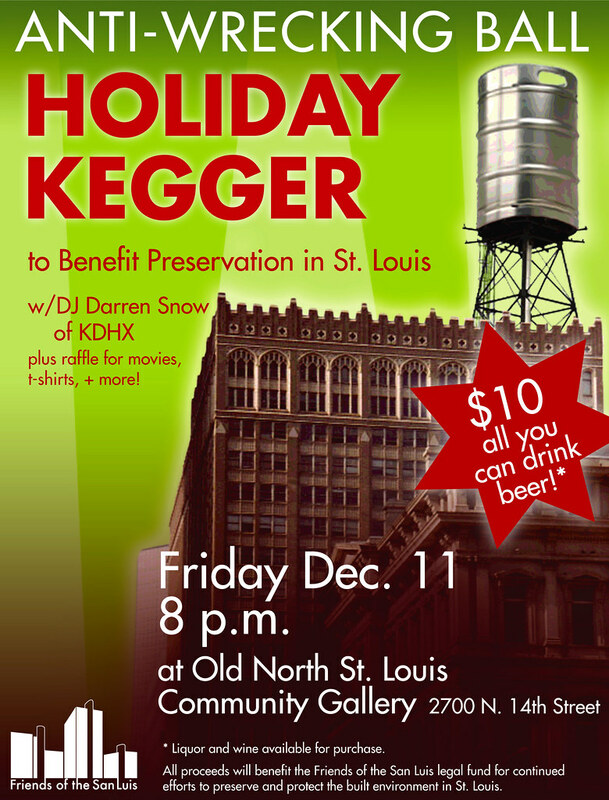 This awesome flyer compliments of Kara Clark Holland (original photo of the Arcade by Rob Powers of Built St. Louis). It's like a dream come true: my favorite building with the worlds largest keg on the roof. Here is some info form the Old North Restoration Group about their newly rehabbed space where the party will be held. With recent announcements about the latest "future" of St. Louis Centre, I am starting a series of posts about its history and impact on Downtown St. Louis. First though, I think we should take a look back to what life was like before the Malling of Downtown. 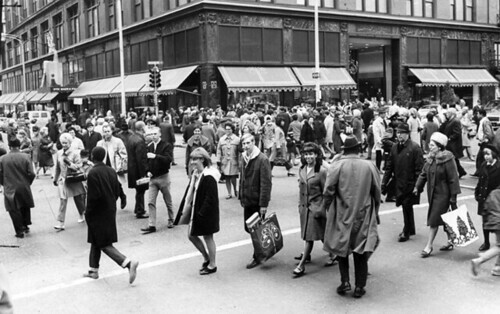 It is hard to believe today that Downtown was once the center of retail life in St. Louis with three highrise department stores: Famous Barr, Stix Baer & Fuller and Scruggs Vandervoort Barney each with half a million square feet of floor space or more, and hundreds of street level retail stores in between. 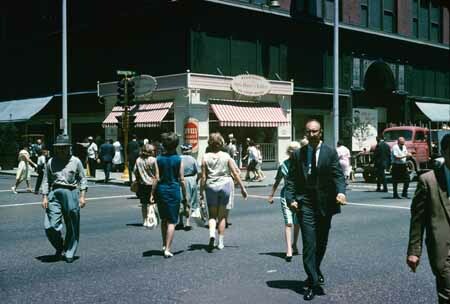 Even while malls and suburban branches of the big three department stores rose in the 1950's and 60's, Downtown continued to attract shoppers and retained a thriving retail scene through the 1970's and even the early 1980's. 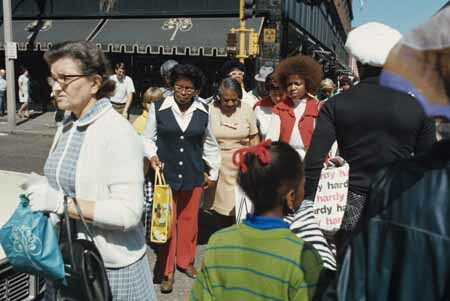 Shoppers and a Bi-State bus cross the intersection of 6th & Locust in the late 1970's or early 1980's. 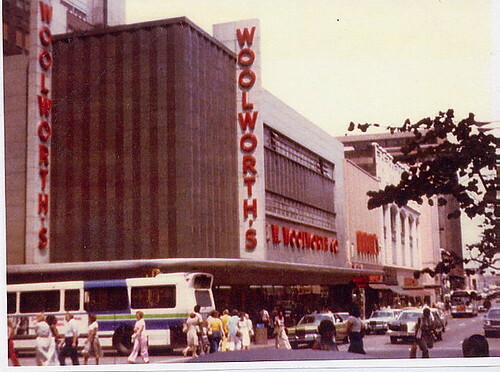 The Woolworths occupied the corner that would become one of the main entrances to the St. Louis Centre mall. Photo from Randy Vines of STL Style. 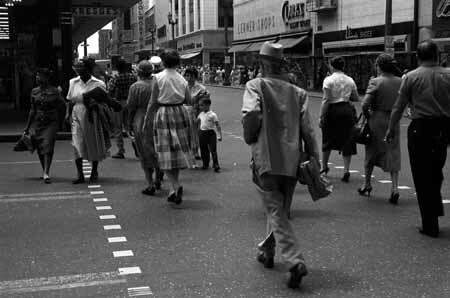 the intersection of 6th & Washington in 1959 looking south. Kresge's occupied the southeast corner. 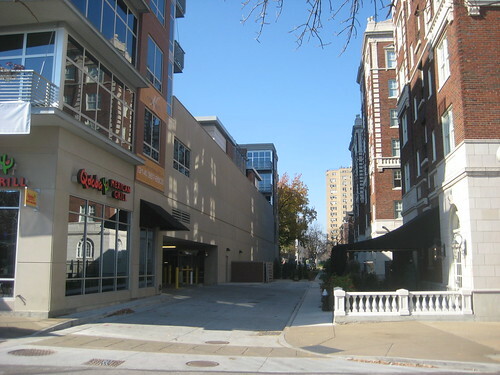 The gap between buildings next to the Lerner Shops is St. Charles Street, which at the time ran continuous through this part of Downtown. This photo and all below are from the Western Historical Manuscript Collection at UMSL's Thomas Jefferson Library. 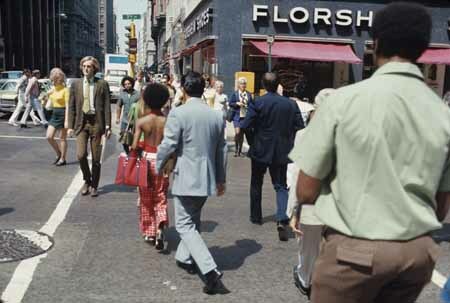 The intersection of 7th & Olive in the 1976 with Florsheim Shoe's at the northwest corner. 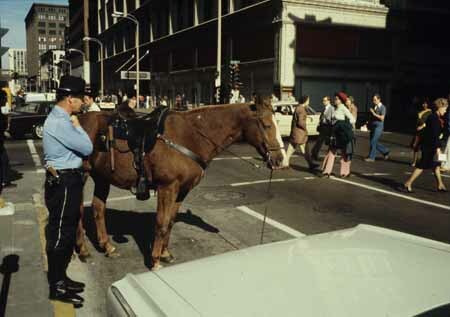 A mounted patrol officer take a break at the corner of 7th & Olive in front of Famous Barr in 1976. Looking north on 7th Street, Stix Bear & Fuller can be seen in the distance. The intersection of 6th and Washington in 1976. Stix Baer and Fuller built a special Bicentennial Candy Shop at the corner of their store. In this post-St. Louis Centre era, the streets of Downtown have once again become a destination for shopping with over 80 unique retail stores, restaurants and service businesses opening since 2000. So this Black Friday stay in bed, skip the 3am big box madness sales and head Downtown for your holiday shopping fix. Macy's Downtown store does open at 5am for you early birds, however most stores run normal hours. This year the Partnership for Downtown St. Louis has come up with an easy way to give with the Downtown St. Louis Gift Card, which can be used at over 100 Downtown retail stores and restaurants. Happy Thanksgiving! Attacked from the rear. 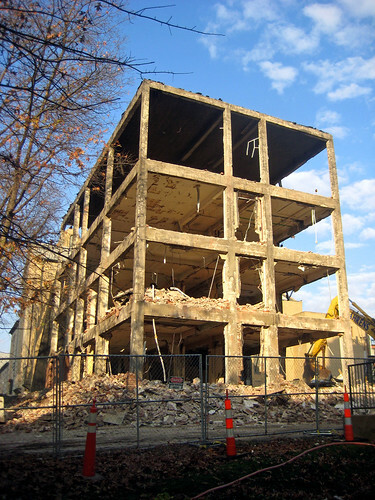 Demolition of the Lafayette Building begins. Regular readers of this blog know that it is easy to get depressed about the state of things here in St. Louis. Then sometimes I read about events occurring elsewhere and feel pretty good about our fair City. Recently I had one of those moments when I read that demolition began this fall on the Lafayette Building in Detroit. 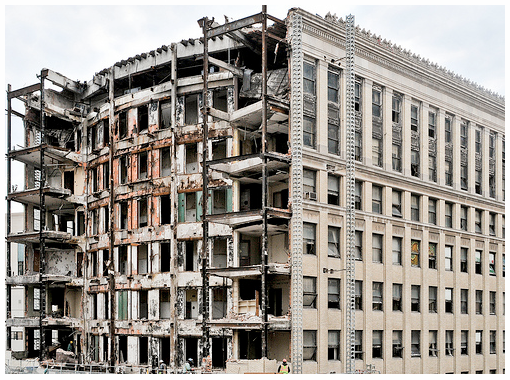 In June of this year, the Detroit Downtown Development Authority had voted unanimously to demolish the building. Reading the history of the building it is easy to think about the similar plight of the Arcade building here in St. Louis, once threatened with demolition by a former owner, then slated for redevelopment as condos, an hotel and office space, construction started, then empty again and waiting. The difference with the Arcade is the story's ending. Just a few weeks ago the City's Land Clearance Redevelopment Authority authorized a 10 year tax abatement on the Arcade Building to entice future redevelopment. Compared to the Arcade, the Lafayette would have been an easy rehab. The Lafayette is half the size and has only been empty since 1997 compared to 1978 with the Arcade Building. In Detroit however, the story ends with an unenlightened city government squandering yet another potential jewel in Downtown. 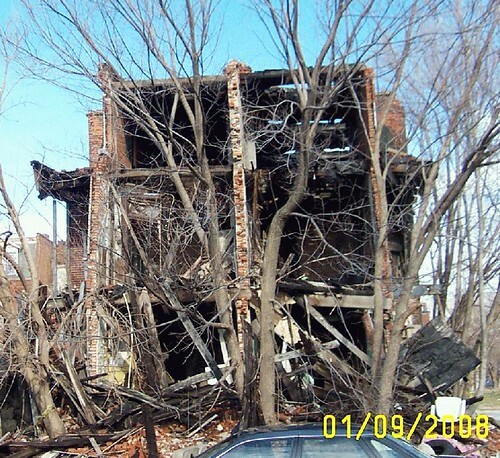 The same narrow narrow minds were responsible for the senseless destruction in 2006 of the former Detroit Statler in 2004-2005. The final agenda for today's Preservation Board meeting is finally online. 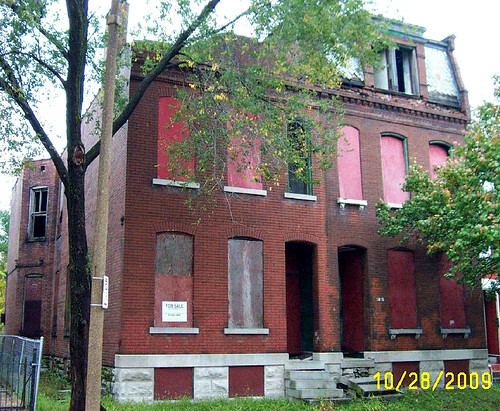 All three of the proposed demolitions of LRA owned buildings in Old North St. Louis have been removed from the agenda as well as he proposed demolition of two buildings on Southwest Avenue that are owned by Favazza's. 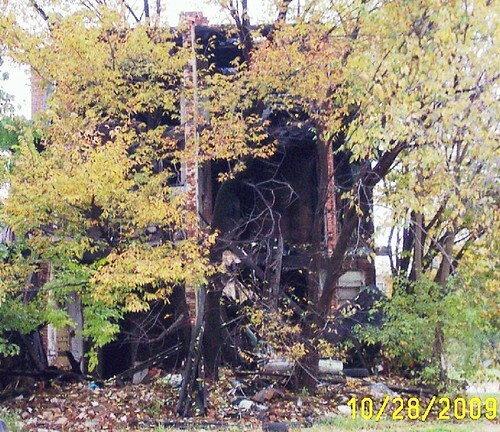 The only proposed demolition remaining on the agenda is a fire damaged house at 3959 N. 11th Street in Hyde Park. 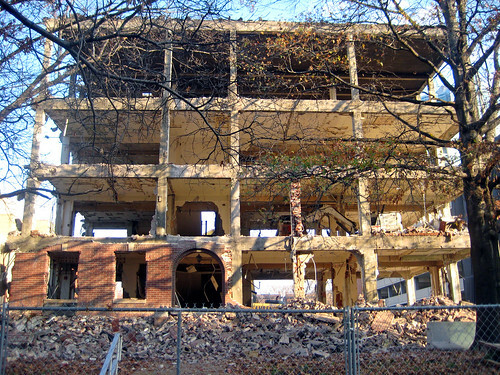 Demolition of the Shoenberg Nurses Residence building at 4949 Forest Park Boulevard has revealed that the building was easily adaptable for new uses. The building's exterior appearance, that of an old heavy brick masonry structure that would be difficult to transform for other uses couldn't be farther from the truth. Beyond the skin deep brick was a solid concrete frame, not unlike that of the also recently demolished San Luis on Lindell Boulevard or that of more recently completed structures such as the 9 North Condominiums, the 4545 Lindell Condominiums, or even the new Centene tower rising in Clayton on the former site of site of Vandervoort's department store. The technology of concrete frame construction surprisingly has changed very little over the years. The concrete frame and slab structure allows for all interior partitions to be completely removed and re-configured for whatever use is desired. This had already occurred at least once in the life of the Shoenberg building. 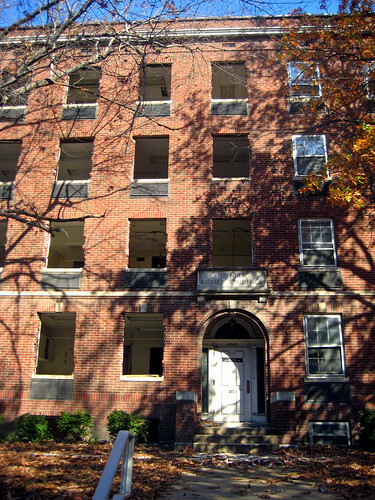 It had been constructed in 1934 as a dormitory structure to house nursing students from the Jewish Hospital School of Nursing nearby on Kingshighway. Its original configuration was likely small rooms double loaded on each side of a central corridor. More recently, the building housed medical clinics, which would have required some reconfiguration of the interior. The building could have again been re-configured for new use, but instead, seemingly because they had not use in mind, BJC is knocking down the building and planting some grass. BJC could have simply mothballed the building until a new use was contemplated. Also with its flexible structural system, the building could have even been more than doubled in size per floor with removal of the rear wall and an addition. Eventually, something might be built there, as it is an excellent location with its easy access the adjacent parking structure, but for the foreseeable future the site will remain a pocket park less than 500 feet from one of the largest urban parks in North America. 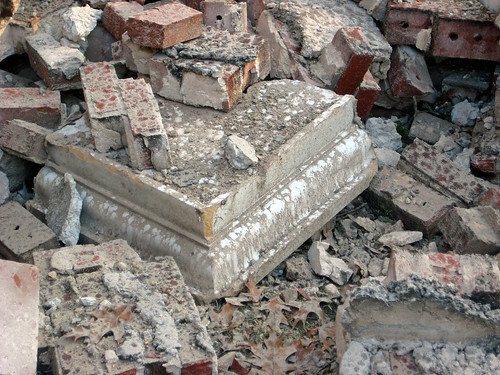 A corner piece of the simple white glazed terra cotta cornice peeks out amid the rubble pile. The Shoenberg building a few weeks ago as it was being prepared for destruction. The wasted opportunities of this building and other recent demolitions such as the San Luis make me think of one of my favorite books: How Buildings Learn by Stewart Brand. One of the main premises of the book is that buildings built with a simple straight forward structure (such as that of a concrete frame) are inherently adaptable to meet the needs of the ever changing world around them. This book should be required reading for all institutional boards of directors and all others that are in the position of decision making regarding construction, renovation, replacement or demolition of their buildings. 3252 N. 19th: From "For Sale" to the chopping block, the LRA way. 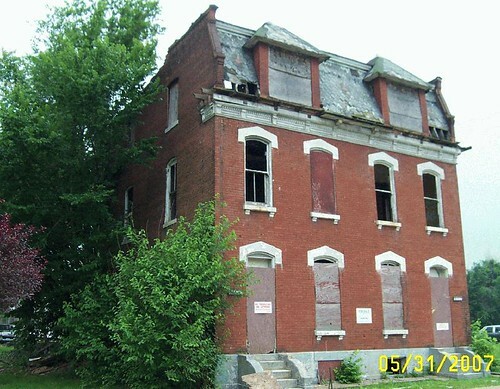 This months Preservation Board agenda is crowded with demolition requests including three in the Old North St. Louis neighborhood's Murphy-Blair National Register Historic District. Curiously, all three have "For Sale" signs on them in the photos taken by the City, many of which are very recent. This pair of townhouses at 1415-17 Dodier is literally right around the corner to the north from Crown Candy. Why this pair would be up for demolition is a mystery. Aerial views show no major breaches in the roofs. They appear quite sound from the front. The rear is no worse, with none of the tell-tale signs of major deterioration. In fact, the lighter areas of mortar joints indicate that the wall has been tuck-pointed! And less than a month ago. Not much change. 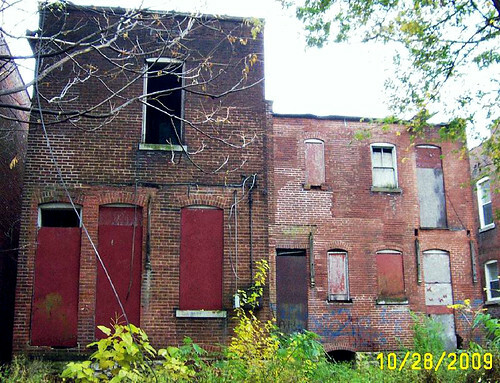 By far this appears to be the worst of the three buildings that LRA is requesting to demolish. The missing rear wall however is not insurmountable. Unfortunately missing or heavily damaged rear walls are not too uncommon in abandoned houses (with rear sloping flat roofs). Once the gutter disappears, water takes its toll and the rear wall rapidly deteriorates. 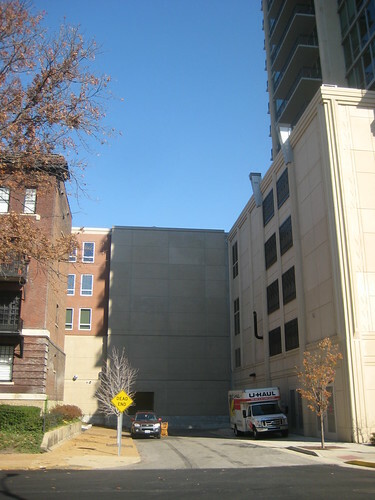 Re-building the rear wall of a building like this is actually not as difficult as it might seem. While it is preferable to do this with masonry, where the budget for that is not available, a framed wall w/plywood and siding will do. The rear of the building last month. Again, little change here, so why the rush to demolition? 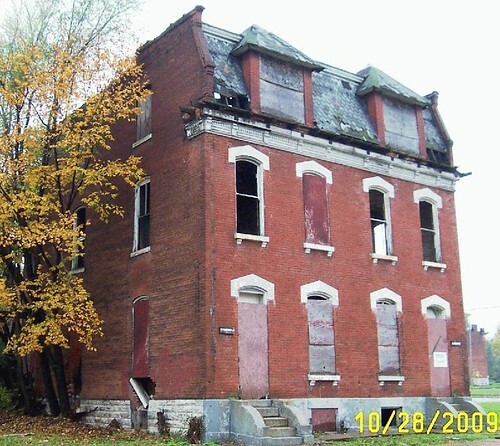 The last potential demo on the agenda is 4106 Virginia, in Dutchtown. 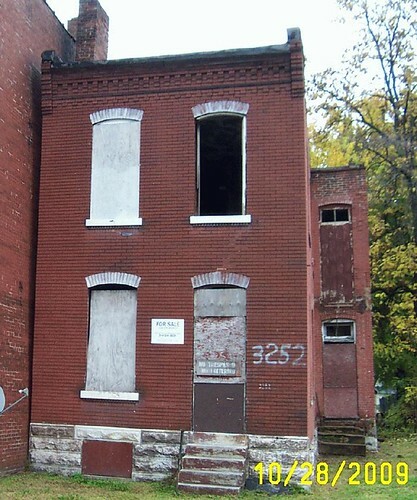 The 2-family home is located in the Gravois Jefferson Streetcar Suburb National Register Historic District. 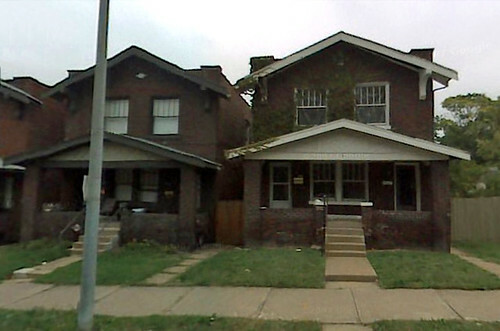 A tale of two houses: 4106 Virginia on the right was inspected in July of 2009 with 7 violations. 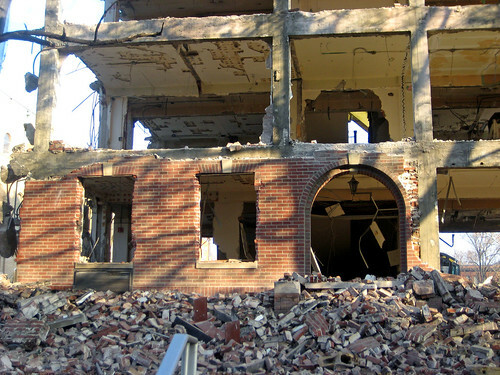 Now the City's Department of Public Safety wants a condemnation for demolition. 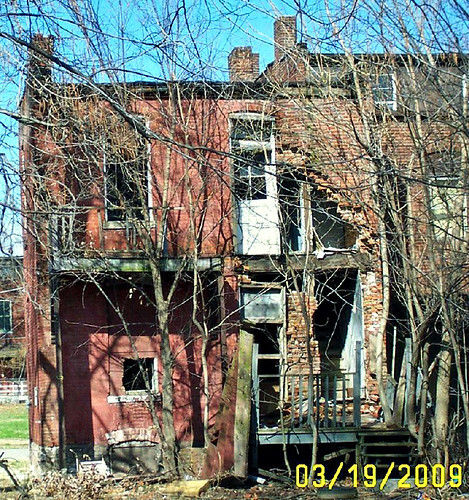 Funny thing is that its neighbor, 4102 Virginia on the left according to the City's property data was in 2004 "Condemned for Occupancy; Can't Demolish". So what is it about 4106 that warrants demolition? Both Ecology of Absence and Dotage St. Louis have coverage of another proposed demolition of two buildings on Southwest Avenue by Favazza's restaurant. 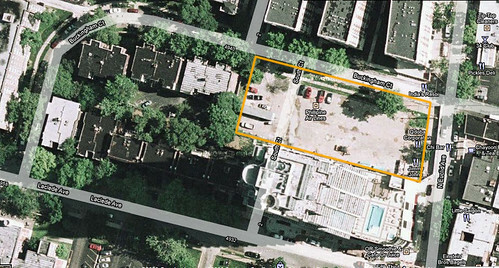 The demolitions are likely wanted to add additional surface parking. The restaurant owns an existing parking lot west of the buildings. 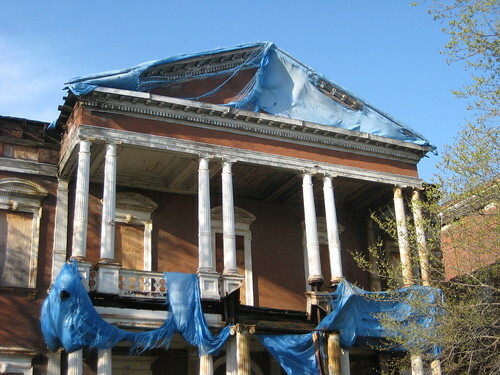 The Post Dispatch reported this morning that the Clemens mansion may finally get a desperately needed renovation. Developer Paul McKee, who owns the mansion complex is teaming with Bob Wood for a $13 million renovation of the the buildings for senior housing and a museum. They are even talking about saving the the chapel and turning it into part of the museum or a community space, possibly with Missouri History Museum as a partner. 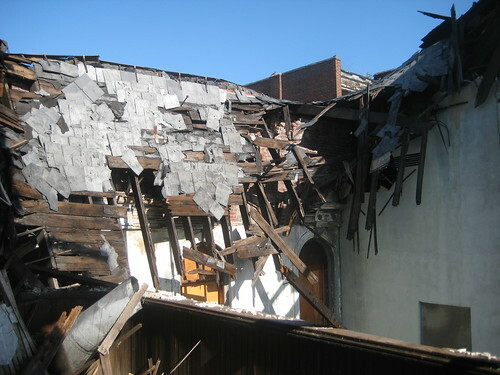 McKee had previously been quoted as saying he though the chapel was unsalvageable. Unfortunately, construction will not begin until funding for the project is in place. They development team has applied for Missouri Low Income Housing Tax Credits as part of the funding which would also include Federal and State of Missouri Historic Tax Credits. The low income credits are awarded annually in February (applications were due last week). Due to limited funding however, only a certain percentage of projects that apply each year get funding to move forward. If the project is not awarded tax credits next February, the building could sit for another year waiting to get funding. That would be very problematic due to the rapidly deteriorating condition of the building. 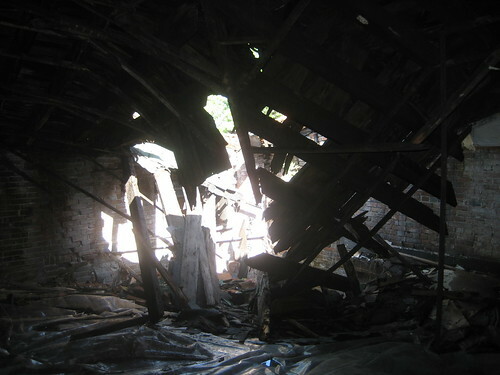 Now that the roof is wide open in two locations in the mansion, the floors which were already deteriorating have had large areas of collapse. considerably since this photo was taken last year. The fact that someone has committed to restoration is great news though. Anything can be re-built. Its just a matter of asking yourself if you want to let it go for a few more years and spend more money re-building or do you stabilize the structure now. 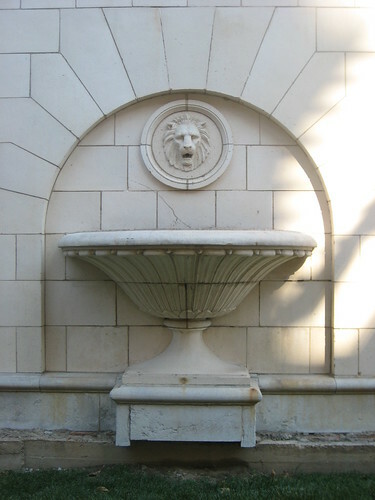 on the Park East and Nine North sites were demolished many years ago. Thursday evening I attended City Affair, a monthly discussion of urban affairs and quality of life issues in St. Louis City. This month our program was a tour of the recently completed Nine North Condominiums by Opus Development followed by some discussion about urban infill. The Nine North site (outlined in orange) just prior to construction. Over the past year I had watched the project come out of the ground occasionally walking or driving along Euclid. Not until Thursday however did I realize the size of the footprint of the project. I knew that Buckingham Court had been closed to Euclid and that the new building was being built halfway into the street. Somehow I did not realize though that the small street called South Court that connected Buckingham to Laclede had also been closed and completely blocked by the new structure. A large blank wall now blocks South Court off Laclede. Generally blocking and closing streets is not a good urban planning. Closing of streets forms super-blocks, reduces connectivity and creates isolation. Jane Jacobs devoted an entire chapter in The Life and Death of Great American Cities to the need for small blocks and plentiful streets in a vibrant city. The City had previously closed South Court when they made improvements to the surface parking lot, so the Opus is not to be blamed for that. While auto traffic has been eliminated along Buckingham from Euclid, a landscaped pedestrian path is still available. The public garage entrance at what was Buckingham Court at Euclid. 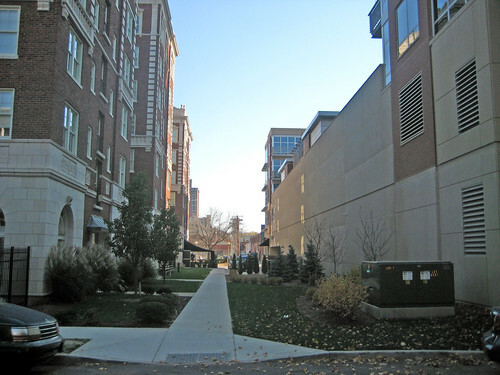 The landscaped walkway that connects Euclid and Buckingham Court. facing the walkway. Compare this with the blank wall of the garage. Despite the closure of streets, Nine North is a great development. 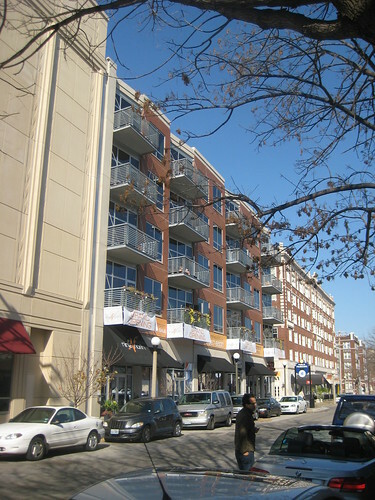 For St. Louis it is a fairly innovative mixed-use project that combined the construction of a public parking garage by the City's Treasurer with private development of a condominium building with ground floor retail on Euclid. All of this on what had been a surface parking lot for many years. The project adds residential density and hides the parking with retail and a short row of condos on the second floor. The development contains a very nice roof terrace with pool on top of the garage. The Euclid elevation of the Nine North Condominiums carries the massing of the Forest Park Hotel to the south with a contemporary look. The well composed building is a refreshing change from the giant blank walls of the Park East Tower, also by Opus. The storefronts are also nicely scaled to fit in with the streetscape of Euclid. Although a bit more isolated now, Buckingham Court remains a quaint street of pre-war apartments and converted condominiums, truly an oasis in the big City. 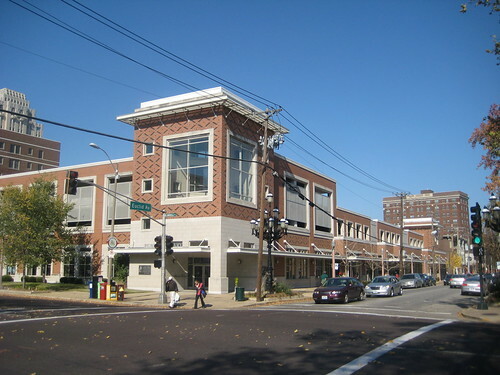 Just a few blocks north is the Argyle Garage which includes retail along Euclid and the Schlafly Branch of the St. Louis Public Library. 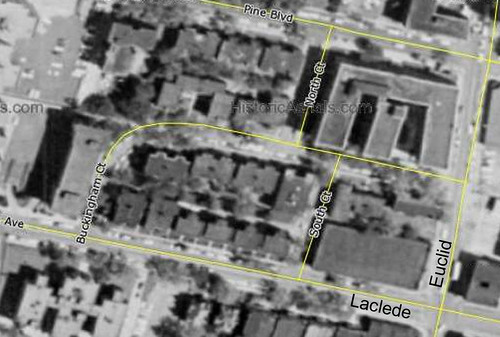 This development like Nine North eliminated a small street, Argyle Avenue, along with six 6-family apartment buildings. I supported this project because of the added storefronts along Euclid which had been the sides of apartments, but adding a few floors of residential on top would have made this a much better development. 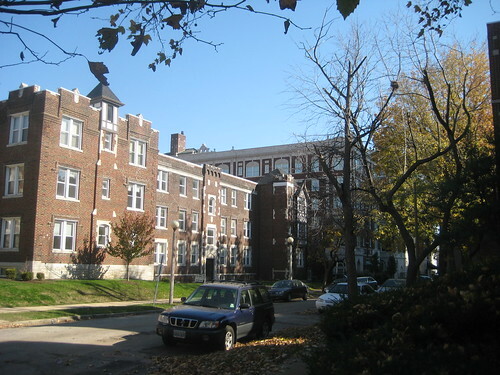 Unfortunately the project was conceived in 1999, a few years before condo-craze hit St. Louis. After nearly four years in business in the Paul Brown Building on Ninth Street, independent coffee house Espresso Mod closed its door for good this past Friday. Owner Paul Charsley was quoted in the Business Journal saying that "Culinaria killed us" and noted that business was down 40% since the store opened in the Ninth Street Garage less than a block north. I had talked to Paul and his wife a few months before Culinaria opened and they said that business had already slowed due to the recession, but that they expected to make it through. That was of course until Culinaria cannibalized both their coffee and lunch business. 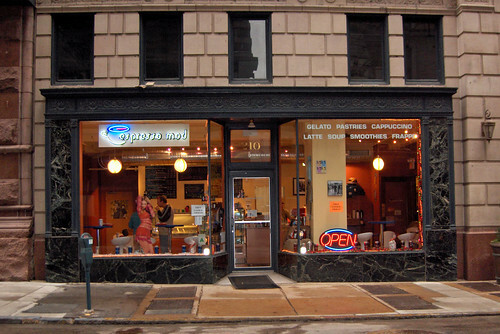 Espresso Mod on 9th Street in the Paul Brown shortly after opening in late 2005. 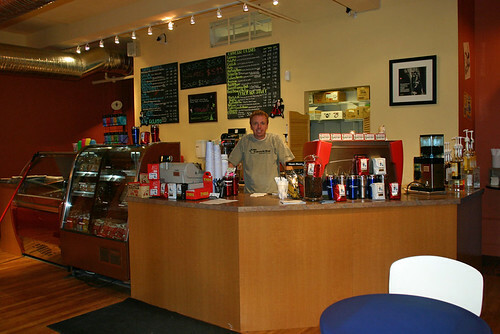 Instead of simply concentrating on groceries, which was a definite need in Downtown, Culinaria went for the jugular by siphoning off business from Espresso Mod, Baladas, City Gourmet (formerly City Grocer) and other existing downtown businesses by including a Kaldi's coffee bar, sandwich deli, pizza by the slice, burgers, quesadillas, and more within their store. An employee of City Gourmet dropped off some coupons in our office just last week for buy one-get one free entrees after 5pm, which leads me to believe that their business has suffered since the opening of Culinaria. 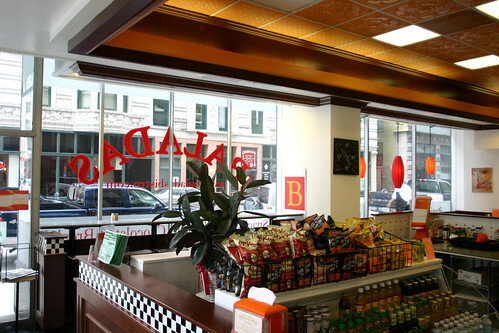 Schnucks received a $4.14 million subsidy from the City, State of Missouri, and Federal New Markets tax credits to build the Culinaria store. That comes to a nearly $200 per square foot interior build-out allowance for the 20,800 s.f. space, which is more than a complete out of ground building costs to construct. This was of course after Desco (the development parent of Schnucks) cashed in their developer fee for the Ninth Street Garage and Old Post Office redevelopment destroying the Century building in the process. Neither Espresso Mod or any of the other small businesses that are hanging on Downtown received this kind of subsidy. Don't get me wrong, I am glad that Downtown now has a full service grocery, but I'm not happy about it's affect on existing businesses. So next time you go out for lunch Downtown please patronize one of the many independent small business choices available. Your dollars make the difference between their survival or their demise.